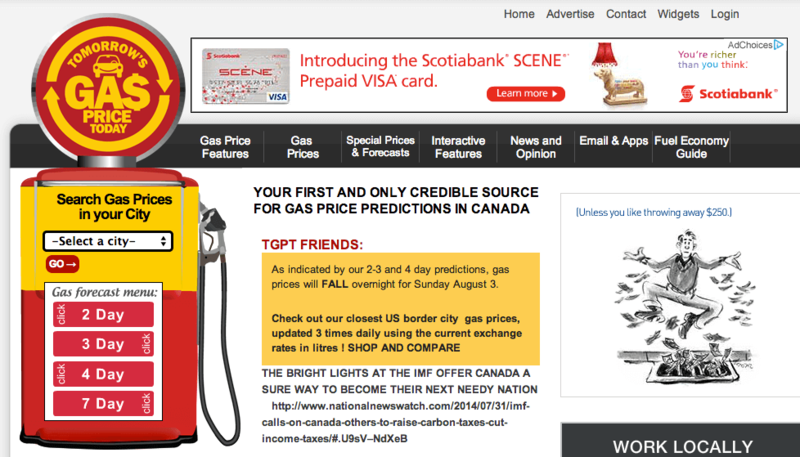 Canadian Federal Politician Dan McTeague engaged CWD (then known as Cyberwalker Media) to do an analysis of an innovative gas price prediction service that he provided to his constituents and Canadian drivers at large. This simple table of daily gas price predictions was drawing significant interest from web visitors. CWD agreed to help McTeague build a branded web property that would evolved his innovate service into a nationally recognized web property and to generate significant revenue from it. CWD used their team to build a new web site called tomorrowsgaspricetoday.com. By 2014, the web property enjoyed more than 40,000 daily unique visitors, more than 50,000 installs to its mobile apps on Android, iPhone and Blackberry. It also had a daily email list of more than 15,000 subscribers. CWD provided sales and marketing strategy, as well as, advertising rate card services and an ad delivery platform. It provides custom ad creative to those advertising clients that don’t have their own. Its technical staff has also adapted the WordPress content management system used to publish tgpt.com so that McTeague and his team could update gas prediction content for more than 200 Canadian cities every day. In the fall of 2014, Cyberwalker Digital work with Dan to sell the property to GasBuddy.com. Key services provided: Online business strategy, web property build, email list development, media consulting, platform development, brand development, content consulting, ad strategy, acquisition strategy and mobile strategy.